wow this is impressive. quantum universe here we come. The vibrational states of two spatially separated, millimeter-sized diamonds are entangled at room temperature by beaming laser light at them (green). The researchers verified this entanglement by studying the subsequent laser pulses beamed through the system. Entanglement is so weird that Einstein dubbed it “spooky action at a distance.” It’s a strange effect where one object gets connected to another so that even if they are separated by large distances, an action performed on one will affect the other. Entanglement usually occurs with subatomic particles, and was predicted by the theory of quantum mechanics, which governs the realm of the very small. The scientists had set up two separate detectors to measure the laser light – one for each diamond. 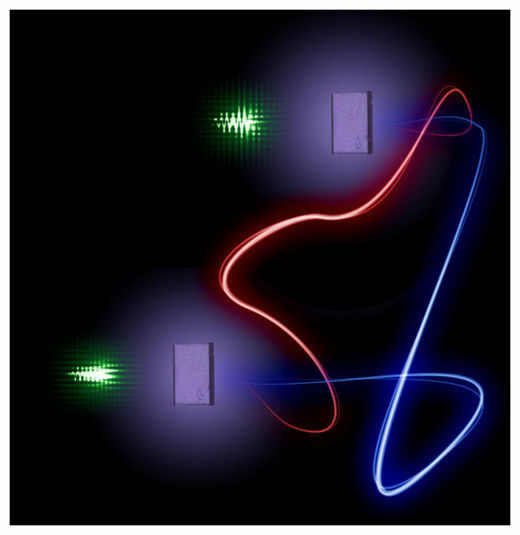 In addition to furthering scientists’ understanding of entanglement, the research could help develop faster computers called photonic processors, relying on quantum effects, said Oxford physicist Michael Sprague, another team member on the project. “The long-term goal is that if you can harness the power of quantum phenomena, you can potentially do things more efficiently than is currently possible,” Sprague said. Posted on December 3, 2011, in quantum, research. Bookmark the permalink. Leave a comment.